Over a decade into J. Cole’s accomplished career, KOD is the closest thing to a trap album the North Carolina rapper has ever created. But despite the switch-up in sound, it’s exactly what hip-hop fans have come to expect from the MC: a purposeful, meaningful album with a message, this time criticizing the glorification of drug abuse in hip-hop. Combined with the revamped production value, it’s perhaps his most compelling album yet, already stirring the eye-opening conversation that J. Cole expressed his gratitude for on Twitter the day after its release. 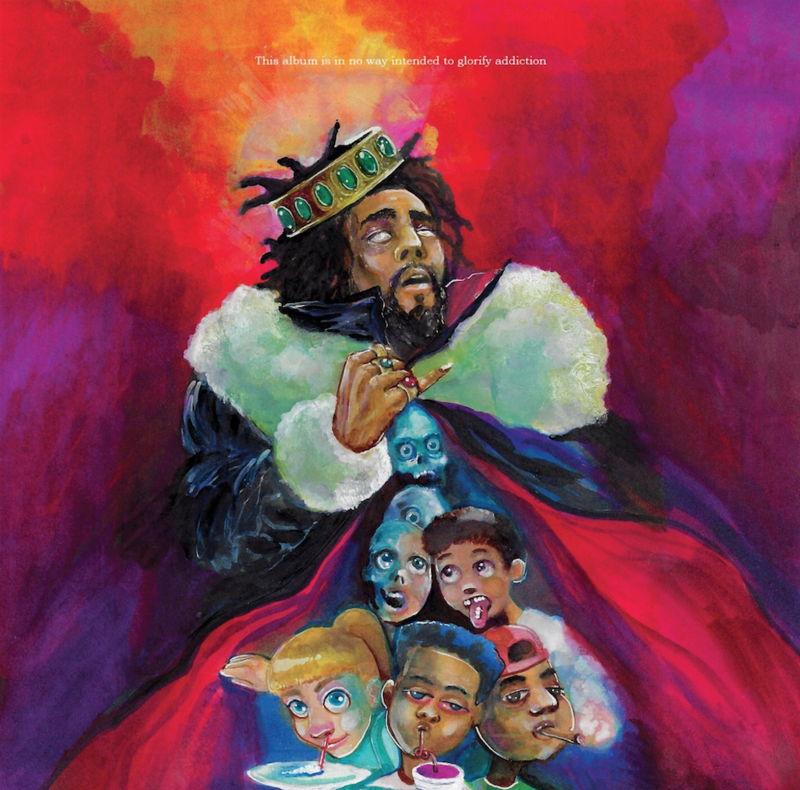 Even the album’s startling cover art is out of character compared to J. Cole’s previous, low-stakes artwork, depicting himself in a twisted royalty with five hazy-eyed, intoxicated children blissfully sipping and smoking from inside the folds of his robe. It’s the same woozy, off-kilter essence that pervades the music behind J. Cole’s admonishments, putting an appropriate spin on the booming beats of the current hip-hop landscape. On “Once an Addict – Interlude,” he gives the most cutting critique of the downfalls of drug abuse, detailing his mother’s relationship with alcoholism and its effect on J. Cole’s mental state. “So ‘Ville became my escape from a feelin’ I hate/Mama cursing me out, depression’s such a villainous state,” he raps near the opening of the song, before eventually revealing that he wishes he had done more to intervene instead of distancing himself from the scene. On KOD, J. Cole is doing his best to right that wrong, gripping the music world by the throat with the surprise announcement of his album and then pouring out 42 minutes of counseling from his soul. “FRIENDS” is another instance of the conscious artist speaking out against drug abuse, building to a breaking point before the chorus as he advises the listener to meditate rather than medicate. Effortlessly settling into his pocket over the ticketing drum loop, it’s an album standout because of both the sonics and the message. Elsewhere on “BRACKETS,” J. Cole pauses from the overarching message to talk about his frustration with the tax system in America and his lack of control over what is being done with his money. “Let me pick the things I’m funding from an app on my screen/better that than letting wack congressman I’ve never seen,” he rhymes on the second verse, decrying the uneven spread of resources while particularly pointing out deficiencies in the schools. When he picks up the pace on “ATM,” J. Cole impresses with a blistering delivery over an equally blistering beat, creating a song that will have lasting replay value within the trap-influenced realm of mainstream rap. His braggadocious, yet self-critiquing bars are fully engaging, taking the popular triplet flow and masterfully bending the tempo at will. It’s hard to say that a 12-song album overstays its welcome, but KOD comes dangerously close to tipping over the critical point after “ATM,” due to its languishing pulse and heavy, dense subject matter. On its own, “Kevin’s Heart” isn’t bad, but in sequence with the rest of KOD it drags on the ears a bit due to the drop off in energy and Cole’s weary vocal delivery. In terms of lyrical content, the subsequent “BRACKETS” and “Once an Addict — Interlude” are more captivating, but the downtempo music behind it puts the responsibility on the listener to keep their focus, rather than Cole gripping them to the speakers with enthralling production. 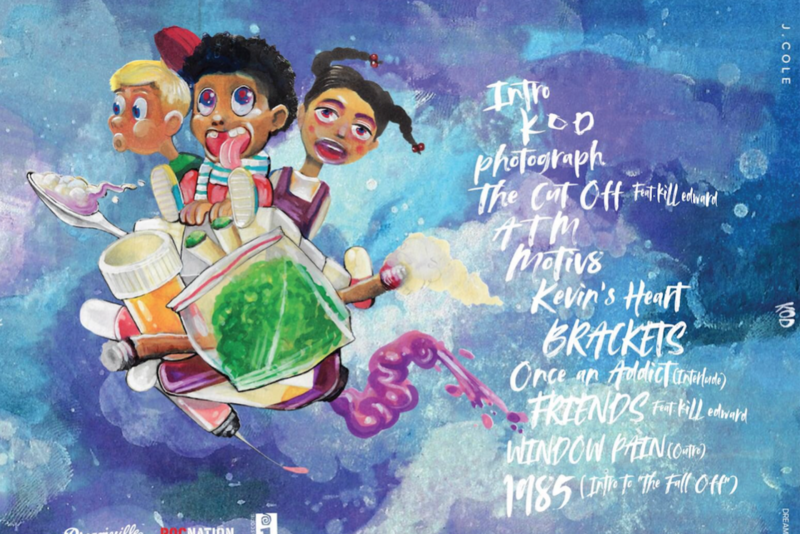 At the end of the tracklist, however, “1985 — Intro to ‘The Fall Off,’” does more than simply tie the album off nicely, doubling as a menacing send-off aimed at much of the younger generation seeking to follow in Cole’s successful footsteps. His dismantling lyrics come across more from the perspective of an amused uncle rather than an angered opponent, offering advice and appearing almost sympathetic to their actions. Still, even if branding the outro as an “intro” didn’t express the message clearly enough, his knowing chuckle after ending the song and album with “Just remember what I told you when your sh-t flop / In five years, you gon’ be on ‘Love & Hip Hop’” certainly does, hinting at more verbal assaults if his warning shot doesn’t receive the desired response. There’s a dry, sneaky humor in releasing KOD on April 20, the unofficial holiday dedicated to marijuana, especially as J. Cole names weed as one of the vices in the outro to the title track “KOD.” If anything, though, it only emphasizes his purpose behind the project, making it impossible to overlook when playing the album. By crafting a more commercial-friendly sound without sacrificing what’s endeared him to scores of fans over the years, KOD has the potential to reach more ears than any previous J. Cole album, and it’s clear that the artist knows what he wants to do with the increased attention.